Focal Press has published Television Development: How Hollywood Creates New TV Series, 1st Edition. Development is a large and central part of the American TV industry, and yet the details of how it works – who makes development decisions and why, where ideas for new shows come from, even basics like the differences between what TV studios and TV networks do – remain elusive to many. 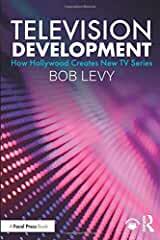 In this book, lecturer and acclaimed television producer Bob Levy offers a detailed introduction to television development, the process by which the Hollywood TV industry creates new scripted series. Written both for students and industry professionals, Television Development serves as a comprehensive introduction to all facets of the development process: the terminology, timelines, personnel and industrial processes that take a new TV project from idea to pitch to script to pilot to series. In addition to describing these processes, Levy also examines creative strategies for successful development, and teaches readers how to apply these strategies to their own careers and speak the language of development across all forms of visual storytelling. Written by the renowned producer responsible for developing and executive producing Gossip Girl and Pretty Little Liars, Television Development is an essential starting point for students, executives, agents, producers, directors and writers to learn how new series are created. Accompanying online material includes sample pitches, pilot scripts, and other development documents.